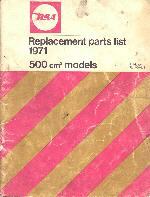 Here you can search for BSA Spareparts no. Check what part No is what. Find where the part is located on the bike. Find a supplier for a special part. Are you intrested as a supplier to be in the database?? So far we have databases on B50 1971 - 1972 and 1973, BSA B25 1971, Triumph Blazer 250 1971 and BSA B44 VS 1970. Click the close box to dismiss it.